"Paul & Rachel Revere Ride Again!" A woman of remarkable "good humour," Rachel Walker Revere (1745 - 1813) lived in Boston's North End during the time of America's Revolution and helped to raise Paul's eleven children. Her domestic life is highlighted against the events of colonial unrest -- the Boston Massacre, the Boston Tea Party, and her husband's famous Midnight Ride to Lexington. After the Revolution, Paul continued his silver and goldsmithing trades and was active in the local masonic lodge throughout his working life. He soon opened a foundry in the North End to forge bells and cannons, and later, founded a copper rolling mill in Canton, Massachusetts. 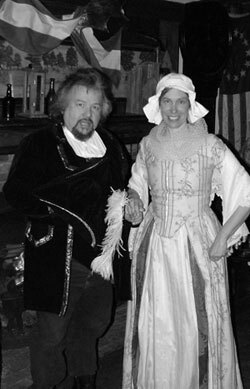 Rachel has performed with her husband, noted Patriot Paul Revere, in the program "Paul & Rachel Revere Ride Again!" as the couple discuss events, both domestic and political, on the eve of their 30th wedding anniversary. Copyright 2010 Â© Women in History Programs. All Rights Reserved.